Great Holiday Gifts for Pet Owners. Need a gift for someone who has everything? Want to buy a gift for a coworker or neighbor who has a cat or dog? Spoil their pet with premium pet supplements that will help their pet feel and look great. Holistic pet supplements make a special and meaningful gift showing your friend, coworker or family member that you care. Ask Ariel Holiday Shopping Guide: Two pet supplements that are great for all pets and you really can't go wrong with Amazing Omegas and Power Probiotic . These two products make a great gift for all pets and are affordable too. Amazing Omegas reduces inflammation, makes coats shiny and soft, fights allergies, and helps the fur glisten. Give the gift of a shimmering holiday coat! Power Probiotics provides powerful immune and digestion support for overall health and easy to administer! Lightweight and small--Power Probiotics makes a purrfect stocking stuffer for XMAS! 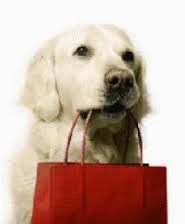 Do you like to take your best friend with you when you shop? Holiday shopping season is fast approaching and some places welcome pets, which can be really great fun for all. However, if you have to leave your pet in the car, remember that even in fall and winter, it is a lot hotter in the car than outside. Pets can get overheated and need water even if it is cold outside.